Taking comfort to an elevated level, Orlando Airport Marriott Lakeside invites business and leisure travelers to unwind on their escape to the Sunshine State. Located just one mile from Orlando International Airport (MCO), enjoy the convenience of our complimentary airport shuttle and our resort-like amenities and services. Relax in modern guest rooms equipped with floor to ceiling windows, internet-ready televisions with Hulu, Netflix access, plus high-speed wireless internet to stay connected. Sip and savor from a variety of on-site dining options including farm-to-table dining and poolside snacks and cocktails. Take a dip in our outdoor or indoor pool and work out in our modern fitness center. Meet in over 29,700 square feet of contemporary meeting space. Discover scenic Orlando and lake views or explore an offsite adventure to a variety of nearby attractions including Walt Disney World , SeaWorld Orlando and Amway Arena. 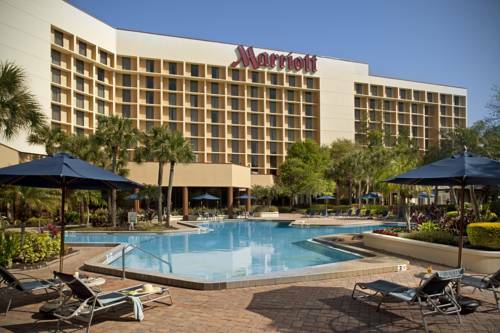 Soak up sun, style and convenience at Orlando Airport Marriott Lakeside. Enjoy a creative and inviting dining experience with fresh, locally sourced ingredients. Our attention to detail is reflected in all we do from seasonal offerings to perfectly plated meals and unique daily specials served with an International flair. Indulge in classic American cuisine during breakfast at this restaurant by the Orlando airport. Crimson Caf overlooks our beautiful resort style pool and Lake Michelle with a very casual atmosphere for you to start your day off right. Enjoy coffee with a friend or a co-worker at this full-service coffee house featuring all of your favorite coffee and tea beverages. Tempt your palate with delicious pastries, breakfast sandwiches, grab-and-go lunch items and snacks. Splash Pool Bar offers a relaxing ambiance to unwind while soaking up the Florida sun, featuring refreshing drinks and snacks. Enjoy music and comfortable deck seating while taking in the outdoor scenery. - Attorney's Title Insurance Fund, Inc.